KPI Management And Best Practices: How To Find The Perfect KPI Solutions? Fact: 100% of the statistics strategically placed at the top of blog posts are a direct result of people studying the dynamics of Key Performance Indicators, or KPIs. An even more interesting fact: the blogs we read on a regular basis are not only influenced by KPI management but concerning content, style, and flow, they’re often molded by the suggestions of these goal-driven metrics. Catchy headlines, backlinks to relevant influencer content, the seamless placement of a numbered or bulleted list – and visuals, visuals, visuals are some of the key drivers of successful digital content. But these tactics and elements are not crafted out of thin air, nor are they sung by the high council of Silicon Valley; they are created by us, the readers. It’s our consumer demands that are communicated to businesses via KPI examples, dictating how the brands or businesses craft and develop the content they publish. We will explain the basics of KPI management, how they’re used in real-life business context and specific KPIs which can be implemented in various industries. But first, let’s start with a simple definition. Exclusive Bonus Content: Get Started With KPI Best Practices To Follow! Learn here how effective KPI management helps grow your business! KPI management is a term used to describe the process of setting, performing, monitoring and analyzing specific industry key performance indicators (or KPIs) which helps companies and organizations in measuring the level of success in reaching their business objectives. The fundamentals of measuring performance indicators are not all that different from well-established scientific evaluation methods: ask a question, set a goal, find a quantifiable means of achieving that goal, test these means, then retest for consistency. Now, apply this methodology to how businesses engage with their clients, and this is what is KPI management all about. Company A asks itself what its best resources are for attracting customers. Company A then creates ads, launches a blog, boosts its social media presence, and optimizes its website for enhanced search engine rankings. The effort is a success, and more customers start pouring in. What happens next? How does Company A measure the success of each individual effort so that it can isolate strengths and weaknesses? The answer is: through a KPI management system based on professional KPI software. Without performance indicators, the bulk of B2B blogs could still largely be based on classic storytelling to rope in more readers, all while falling behind their direct competitors. So, why is something that seems rather entry-level often so difficult for some executive boardrooms to grasp? Because in practice, getting a handle on performance indicators is far more complicated and costly than an innocuous experiment alone. All businesses have a limit on expenditure; as essential as management of KPIs is to growth, an improper pursuit or inaccurate action can result in a heavy, flowing drain on revenue. Here, we will discuss KPI best practices and how to find and leverage the most effective KPIs for your business. But first, we will address a very important KPI-related question based on the studies of a certain Mr. Bernard Marr. “It is more important than ever that business leaders and senior executives are able to make better-informed decisions, improve performance, and seek out new and novel ways to gain the edge over their competition,” Marr explains. At this point, it’s worth noting that there are countless businesses that have found success without ever even considering performance indicators in practice. Not every venture includes plans for expansion – and that’s okay. But for those who want to grow their businesses and track their progress effectively, KPIs are the choice unit of measurement. Key performance indicators enable businesses to measure their own ability to set and achieve goals. They are often used to measure customer satisfaction, employee performance, and general engagement levels with any audience the company specifically targets, and they are handled through a KPI management tool. For example, customer satisfaction metrics are used to drive better customer experience. KPIs, in their essence, transform numbers into behavioral responses by isolating indicating actions with sophistication. These indicators provide the most precious intel a business can buy, fostering a window of insight into targeted efforts that can consistently produce results. Once again, the effort to gain this intel can be damaging if handled improperly. Ineffective management of KPIs means little actionable data and a terrible return on investment. This, in turn, will cause problems like wasted focus, wayward strategies, and loss of revenue. It is important to think deeply and collectively about best practices to manage KPIs, yet there are universal guidelines that can help steer businesses in the right direction. 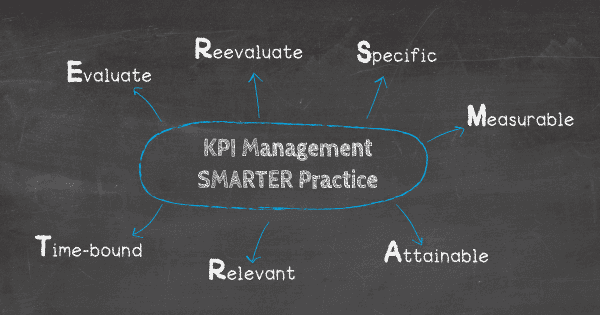 We’ve asked the question: what is KPI management? We’ve also established why performance indicators are so important. Now it’s time to look at finding the perfect KPIs for your business in more detail. Many industries have used KPI best practices and KPI management solution to isolate their strongest indicators, such as in the field of retail analytics. That’s not to say these indicators are the only choices for retail businesses, but they do make a solid starting point. “The right KPIs or KPIs management solution for you might not be right for another organization. KPIs should match your specific strategy and goals, not just your industry,” says Ted Jackson of ClearPoint Strategy. To choose between following industry standards or embracing unique indicators is an ultimatum every manager will have to face. For those who want to experiment with less-explored, off-the-beaten-track KPIs, there are two standard practices for evaluation that can help businesses determine whether those particular performance indicators will be effective: the “SMARTER” criteria and the “6 A”. Specific: Start with a specific objective that can be isolated. Pick it apart – remember that customer satisfaction, sales, retention, etc. can all be measured with different KPIs. Measurable: Find a definitive way to measure the data that needs recording. Once again, simplification is key here. There should only be one effective method of measurement – an essential aspect of KPIs management. Attainable: Make sure the objective is something that can be readily attained. One way of testing this is by making sure the business has completed this objective before. Relevant: Ask if these goals are relevant to the target groups. Would achieving this objective impact the groups you are trying to engage, and in what manner? Time-bound: Create timeframes and deadlines to accurately measure the KPI. If primary trials produce the desired results, extend the timeframe on the next round. Evaluate: See if the KPIs provides the actionable data needed to achieve set goals. Brainstorm with the team to see if any other angles should be examined. Reevaluate: Test and retest for consistency before regular implementation. Effective business strategies are built around KPIs, so ensure the data is providing exact and specific answers. Aligned: The KPI aligns with the activities of its specific targets. As long as business continues as normal, collecting the data should be effortless. Attainable: The indicator is easily attainable so that it can be measured. If data doesn’t start regularly flowing once the trial has begun, there may be something amiss. Acute: The KPI makes others well-informed, or acute, of the goal and its measurement. If the purpose of the KPI is at all unclear, it may be a sign to try a different indicator. Accurate: The data pulled from a KPI will be used to accomplish future objectives; it must be reliable and accurate so that it does not lead to any misinterpretation. Actionable: KPI results produce data that influences a plan of action. KPIs should fuel new processes – if there is no follow-up, then the metric loses its value. Alive: The data can be leveraged throughout the company’s lifespan. It should become a constant throughout an ever-evolving business. Marketing may be all about ROI, but that doesn’t negate the need to correctly connect the dots. And to do that, businesses need to achieve actionable results through KPI best practices. Mistakes, particularly when you’re dealing with managing KPIs, are not only costly; they could prove devastating to your revenue and resources. To help you avoid such mistakes, here are key considerations for your reference. As mentioned, selecting the KPIs can turn into an expensive witch hunt, sending marketing departments spiraling into an abyss of pointless data. Ironically, many cost-minded professionals prefer KPIs that seem more direct, such as financial goals. However, focusing all your efforts on instant gratification could be a huge mistake. When setting up your KPIs, do your best to focus on future standards and not past performance. However, keep in mind that these future standards you want to achieve must be realistic; otherwise, your efforts will only lead to a performance assessed as ‘poor’, with frustrated managers and disgruntled employees that will feel less engaged and as a result, less motivated. Finally, once you know what to measure and how to measure it, you should agree on an action plan with other key stakeholders across the organization. Define who does what and set milestones along the way, all while keeping communication transparent and open. All too often, no clear action plan is defined after setting up a KPI-driven strategy, which leads to misunderstandings and mixed priorities that impact the teamwork, the atmosphere, and ultimately – the growth of the business. How To Choose The Right KPI Management Solution? Be easy to use and accessible to everyone within the organization. Offer data visualizations that are clear, concise, and allow your data to tell a story. Give you access to all of the data and insights you need for success in one central space – no need for spreadsheets and over complex files. Empower you to work with and customize the KPIs that will benefit your business the most by organizing your data in a neat and clear way. Give you the option of managing KPIs effectively online and mobile devices. Come with an exemplary level of user support. Help you reach and exceed your organizational goals on a sustainable basis. Provide you with a methodical approach to KPI reports. Reduce time needed to collect and analyze KPI data by automating processes. Enable you to integrate custom data connectors to have all your business information in one centralizing place. To squeeze the maximum value from your KPI data management activities, it’s essential to work with the right online data analysis tools for the job. 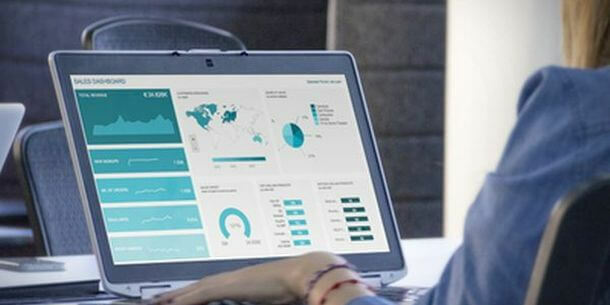 To track, monitor and gain valuable insights from your performance indicators, selecting the right KPI management software will help you steer your success and gain an all-important edge on the competition. When it comes to managing KPIs, the tools you work with should offer all of these mentioned key attributes. Through a KPI data management software, you can benchmark, measure, and track your performance with ease, visualizing insights in a way that will allow you to make swift, accurate, and informed decisions that will help you drive the business forward. With a robust mix of customizable KPIs to choose from, there is a performance indicator that covers every critical aspect of managing and developing a business, regardless of industry or sector. When it comes to KPI data management and maintaining KPI best practices consistently, our software and solutions work. Moreover, as gaining the ability to build your own KPI reports based on your specific goals and needs, you will be able to mould your success and improve your performance in a sustainable way, allowing you to thrive even in the most challenging of circumstances. A solid starting point would be looking at the standard KPIs used within your industry. As we explained real-life examples, now we will focus on specific KPIs that can be used as templates. Let’s start with the retail example. 1. Retail: When will my customers spend more money? In these businesses, certain standard retail KPIs include: Average Transaction Size, Total Volume of Sales, Back Order Rate, Customer Retention, Total Sales By Region Order Status, Perfect Order Rate, and Return Reason, among others. Each of these metrics integrates cohesively with a retail operation. To have an effective strategy built around KPIs, you must clearly define your goals. Do you want to create a conversation or to engage individuals? Do you want to sell them a single-use product or an idea that would influence them to keep coming back? Are you measuring the output of your employees by their sales numbers or by something a little more abstract? These are all questions worth asking, and for every one of them, there is a matching KPI. 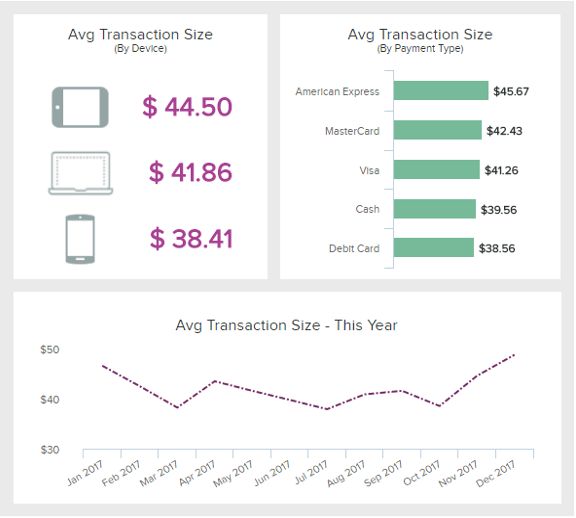 In the example above, we have depicted the Average Transaction Size, a significant KPI for the retail industry since it can evaluate when your customers are more likely to spend money. The goal is to increase this KPI over time, but it would make sense to combine this metric with others mentioned, to make your insights more clear. And if you want to additionally polish your reporting techniques, you can have a look at some of our best practices for different functions in the company – management reports, sales reports, or marketing reports – the choice is yours. 2. Sales Management: How do we stand regarding our targets? Another example we can illustrate comes from managing the revenue of your business, one of the most important sales KPIs for any business. You need to check where you stand after planning and forecasting your sales targets. The goal is to outperform, but certainly, it is wise to evaluate your strategy if issues in the performance arise. 3. Finance: How do we handle the company’s assets? This example comes from the financial industry. Financial analytics are the core of every finance department, business, and employee. To generate proper value and increase performance, there are various financial KPIs that can advance the collection, monitoring, and analysis of the vast amount of data. 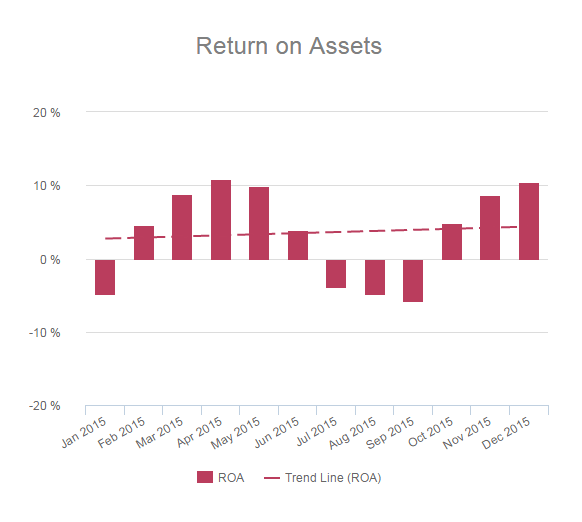 Our example depicts the Return on Assets, which need to be as high as possible since you can show how a company’s assets are being managed. All of these business analytics examples show how correct KPI management can bring positive business outcomes by utilizing the right solutions and software. Now, let’s take a look on some real-life examples. Here are three shining of examples of real-life organizations using KPI management to increase productivity, efficiency, and become smarter in their goal-setting and strategic efforts. As we’ve established, data is only useful if you’re able to manage it effectively and gain the insights you need to encourage growth and development. Facing the challenge of fragmented data and poor data management processes, a growing US-based application provider was unable to track the performance of its core sales team. To overcome this challenge, the company used our dashboard reporting software to improve its decision-making processes as well as manage its sales and customer service performance more efficiently. By gaining the ability to integrate a customizable, KPI-driven data visualization tool into its existing CMS and gain access to all of its most important data in one central location, the company reaped the rewards of improved customer insights, increased operational efficiency through boosted internal communication, and with the ability to access KPI performance information and insights via mobile devices – enhanced productivity levels throughout the business. A testament to the power of using a KPI real time dashboard to enhance internal performance. To demonstrate the enormous power and potential of successful KPI management, this particular example applies to an entire major city. Belfast has a population of over 330,000, and since the area’s political unrest settled down, the city has undergone significant economic growth as well as commercial development. Inspired by this new chapter of prosperity, the city council wanted to improve the quality of life for its residents by rolling out a number of key initiatives throughout the city. To do so, the council created a one-page map of their strategy, which involved encouraging culture and diversity, reducing waste and emissions, and stimulating growth through regeneration and tourism. After prioritizing its initiatives, the city council selected a set of KPIs that aligned with their individual goals and used KPI management solutions such as a data dashboard to uncover new insights and measure its performance. Through developing a key KPI management solution and using reporting tools to visualize its performance in a host of critical areas, Belfast is now a greener city and was recently named one of the world’s best visitor destinations. A nuclear office is responsible for the regulation of nuclear safety and security for the nation in which it’s based, and it’s safe to say that it’s an important job. An organization likes this usually manages 400 employees or more. Recently one of the world’s most pivotal nuclear regulation offices identified a lack of interdepartmental cohesiveness, something that was affecting its overall output and productivity. To overcome this roadblock, the organization adopted KPI management solutions to streamline its internal processes and improve leadership as well as interdepartmental relationships. After interviewing individuals within the organization and collaboratively mapping out a management strategy, the organization carefully selected its core KPIs to help answer its most important questions and monitor its performance over time. By leveraging performance indicators to its advantage, the nuclear office has not only helped to significantly boost engagement throughout the organization; it has also improved its overall business intelligence and productivity levels. A testament to the power of employing KPI best practices in the digital age. At datapine, we strive to leverage technological innovation to provide the answers managers need to narrow their goals and propel their business to new, prosperous heights – and KPI analysis is just one of the many duties integrated into our self-service BI tools. To learn more about how you can help develop your business with the right KPIs, sign up for a 14-day trial today! And it’s completely free!